With college football kicking off last week and the NFL season on the horizon, there’s much to discuss in the realm of football. The Pitt News staff gives its take on some of the biggest storylines that emerged from the past seven days. Since entering the league as the fifth overall pick of the 2014 NFL Draft, Khalil Mack has developed into a top-three defensive player. In his first four seasons, Mack accumulated 40.5 sacks with nine forced fumbles, earning Defensive Player of the Year honors in 2016. He has been a dominant, imposing force who is considered by many to be one of the best players in the entire league — many meaning everyone except his former team, the Oakland Raiders. In a puzzling move Saturday, the Raiders sent their star defensive end to the Chicago Bears in exchange for a plethora of picks, including two first-rounders. The trade came after the Raiders and Mack’s representatives were unable to come to an agreement on a contract extension. 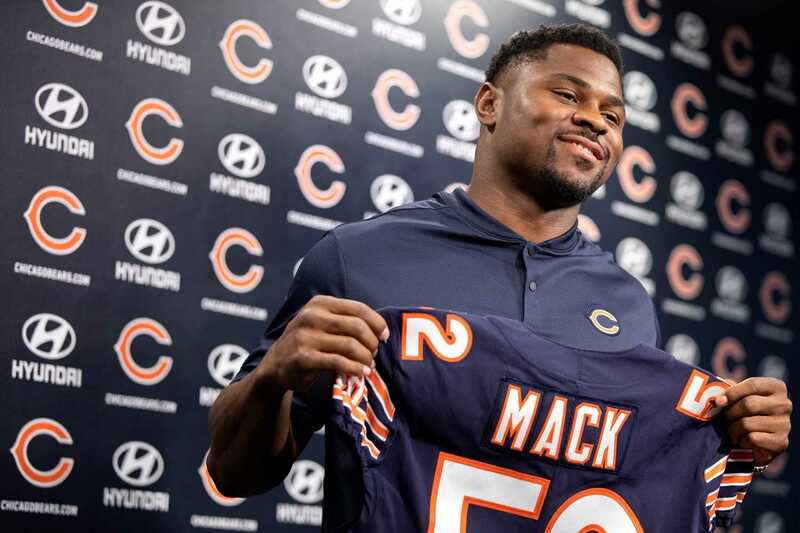 Immediately after completing the trade, the Bears signed Mack to a six-year, $141 million deal — the largest deal for a defensive player in NFL history. The Bears landed a top-tier defensive wrecking ball in his prime, while the Raiders just look stupid. The price tag may have been high, but you always pay the man. You don’t trade away such a coveted and talented player because he wanted money. Mack earned his payday, and if the Raiders wanted to be cheap they shouldn’t have given QB Derek Carr his awful extension in 2017. Now Chicago has its defensive star of the future, while Oakland may have let a generational talent slip away. Classic Raiders! Last college football season, it seemed as if “the U,” or the Miami Hurricanes, were back on top after failing to meet the program’s championship standards over the past decade. Miami started its 2017 season 10-0 and seemingly on their way to the College Football Playoff. The Hurricanes even started the turnover chain, which they would give to whoever forced a turnover during the game. Then they came to face Pitt and first-year quarterback Kenny Pickett in what many assumed would be a blowout by Miami. But the Pitt defense stifled the Hurricanes and Pickett played fantastically, throwing for 193 yards and rushing for two touchdowns as the Panthers ended the Miami’s perfect season and upset the No. 2 team in the country for the second straight year after beating Clemson in 2016. Miami took a downward turn after that game and it looks like it has continued into this season. They got run over by Clemson in the ACC Championship game, 38-3, which ended their hopes of a playoff berth, and then lost 34-24 to Wisconsin in the Orange Bowl, giving them a 10-3 record on the year. The Hurricanes took on LSU at AT&T Stadium Sunday night and not much changed from the end of last season. They trailed 27-3 at halftime and eventually lost 33-17 thanks to two interceptions from quarterback Malik Rosier and only 80 team rushing yards. Strangely enough, it seems like the Panthers and true freshman quarterback Pickett halted Miami’s return to dominance and sent them back to mediocrity with last November’s upset. Unless the Hurricanes can turn it around soon, that loss against Pitt may be one the program remembers for a long time. Kneeling and the anthem debate. The vaguely defined catch and helmet collision rules. Countless injuries to some of the biggest names in the game. These are a few of the issues plaguing the National Football League, which has seen a sharp decline in quality and viewership the past few years. A large number of people don’t want to watch a sport become political, while many others have no desire to watch a sport where the referees aren’t consistent and don’t seem to know the rules of the game. With NFL ratings down a whopping 10 percent last season, there is one thing to get excited about this fall — the return of fantasy football. Fantasy football gives viewers a reason to care about the NFL when they don’t even want to. Participating in a fantasy league is thrilling, strategic, exhausting and maybe even financially rewarding. It is the roller coaster ride that the real NFL lacks. In a league where you often know who will win week in and week out (cough, cough, New England), fantasy makes things interesting. You never really know which Joe Dirt player will come out of nowhere to go bonkers, or which star player will drop a dud and cost you the week. There is no greater glory than putting together a team that you can gloat to your friends about when you sit atop the standings at the end of a four-month period that took years off your life. An estimated 75 million Americans participated in fantasy football in 2015, and that number has certainly grown and will continue to do so. This fantasy season is shaping up to be one for the ages. Star players like David Johnson and Odell Beckham Jr. are returning to action, but will they return to form? Can Kareem Hunt and Alvin Kamara build on their rookie years? How will Saquon Barkley do this year? Fantasy football is the greatest part about the NFL. It could end in heartbreak or it could end in happiness. Either way, you won’t regret the decision to partake in the only thing keeping many football fans invested in the National Football League. This offseason, quarterback Kirk Cousins signed a three-year deal worth $84 million with the Minnesota Vikings. Cousins spent the first six years of his career with the Washington Redskins, and the last three of those as their starter. In those three seasons since taking over as the full-time quarterback in the nation’s capital, Cousins compiled 13,176 yards, 81 touchdowns, 36 interceptions and a 67 percent completion rate while leading a dysfunctional Redskins organization to a 24-23-1 record. Cousins will now join a talented offensive personnel that includes two stellar receivers in 2017 Pro-Bowler Adam Thielen and Stefon Diggs, who combined for over 2,100 yards last season. He’ll also have second-year running back Dalvin Cook, who was on pace for a 1,000-yard season in 2017 before getting hurt in week four. The Vikings’ supporting cast marks a major upgrade from the one around Cousins last season, when Samaje Perrine led the Redskins with just 603 rushing yards and Jamison Crowder with 789 receiving yards. If a journeyman like Case Keenum can help take last year’s Vikings team to the NFC Championship, I don’t see why Cousins, a clearly superior player, can’t take essentially the same team to the Super Bowl this year — and put up impressive numbers along the way. As a true freshman last season, Tua Tagovailoa stunned the nation when he stepped in for the Alabama Crimson Tide during halftime of the National Championship and secured the College Football Playoff trophy. Following Tagovailoa’s triumph, Alabama head football coach Nick Saban was peppered by questions from the media about who would be at the helm for the Tide in 2018. Saban found himself needing to choose between Tagovailoa and incumbent junior starter Jalen Hurts, who led the Tide to a 27-2 record over his previous two seasons as starting quarterback. After week one of the college football season it appears Nick Saban’s questions have been answered. Tagovailoa showed that the National Championship was no fluke with a huge performance in his first career start. The Hawaii native completed 12 of 16 passes for 227 yards while racking up three total touchdowns — two passing and one rushing. It’s clear now who Nick Saban prefers to quarterback his team and Tagovailoa’s shining play Saturday should leave no doubt. It seems pretty obvious at this point that Saban made the right choice and needs to start Tagovailoa the rest of the year if the Tide wants to make another deep College Football Playoff run.